I found this heart pencil holder at the Silhouette Store and cut them on my Cameo. The sentiment is My Creative Time's~Teeny Tag Greetings. The small skittle embellishment is from DoubleClick and I finished with a small bow using ribbon from my sweet friend, Karen at Little Scrap Pieces. 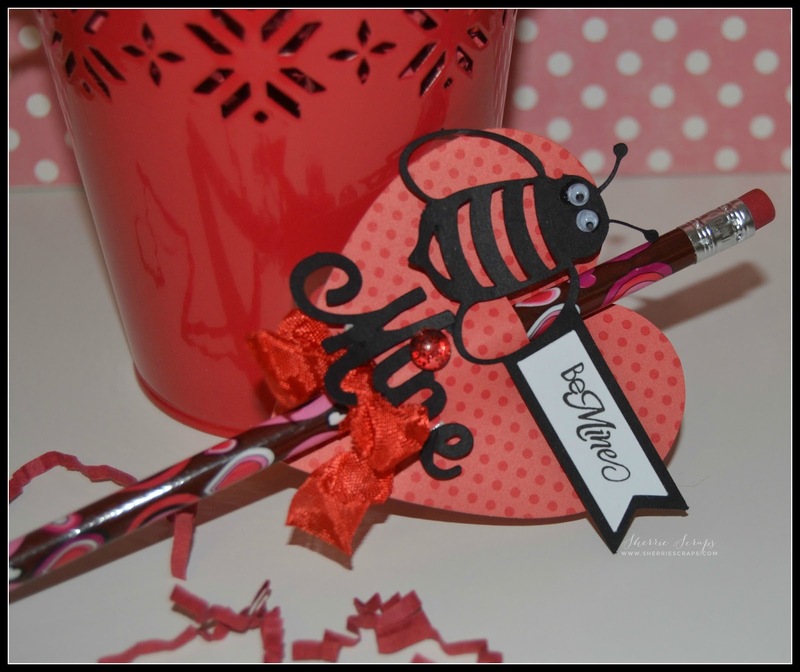 What a adorable Valentine project!! Love it!! Have a great day. OMG these are just too cute. What a fun little treat for any child. Oh these are just darling Sherrie! So cute! Oh these are just so darling! I love them! It almost makes me wish I was still a kid again so I could go to school and hand these to my favorite people! I really love how you used the bee to apart of the sentiment and then added another sentiement on the teeny tags! so cute! Thank you for linking these up in our Funday Friday challenge my friend! Sherrie these are sooo super full of cuteness !!! Love them !! Those are sooo CUTE! LOVE the little bees! :) Have a great day! 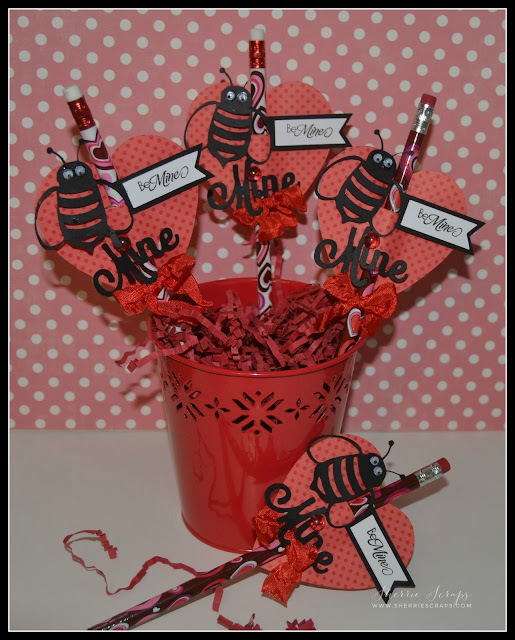 Bee-u-tiful, you did a gr8t job with these and love your display as well! Super cute treats! Love those adorable bees! The kids will love those eyes, they are so fun! These are soooooooooooo stinkin' CUTE CUTE CUTE!!!!! LOVING those little bees!! Thanks for linking up with DoubleClick my friend!!!!!!!!!!!!!!!!!!! These are so super cute Sherrie!!!! Such cuteness! What a fun little Valentine's Day treat (something not full of sugar is a welcome change)! These are awesome treats. I have a similar one I was going to make for my students. Thank you for joining our “Valentine/Heart” Challenge this week at DoubleClick Skittles. Too cute! They are going to enjoy this! I absolutely love the pencil holder..have not seen this!! Totally cute & fun!! Love the cute bee! These treats are so cute Sherri I love the little bees. So cute - great idea thanks for sharing!!! These are adorable! Such a cute treat! Thank you so much for playing along with the Have a Heart Challenge on the Simon Says Stamp Wednesday Challenge Blog! Those are really cute and I love the fact it isn't candy related. Not that there is anything wrong with candy, but it's refreshing to see other things. Well done. Oh my...this is super cute and would be perfect for next year-since I am a week late for 2016 Valentines!